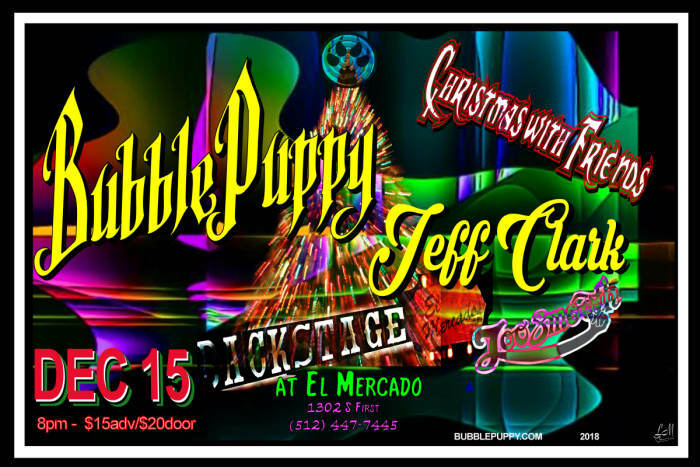 Join The Backstage as we welcome back Austin legends BUBBLE PUPPY with special guest the legendary Jeff Clark with sit-in guests from around the world! Doors at 7pm, downbeat at 8pm and the show is all ages! If the show does not sellout, we will have tickets at the door for $20. www.AustinBackstage.com for information, location and directions! HISTORY: Bubble Puppy was formed in 1966 in San Antonio, Texas, by Rod Prince and Roy Cox who had previously performed together in the rock group called the Bad Seeds. Looking to form a "top gun rock band" based on the concept of dual lead guitars, a staple of southern rock that was highly unusual on the psychedelic music scene, Prince and Cox recruited Todd Potter, an Austin, Texas guitarist. With the addition of Danny Segovia and Clayton Pulley, the original line up of Bubble Puppy was complete. The name "Bubble Puppy" was taken from "Centrifugal Bumble-Puppy", a fictitious children's game in Aldous Huxley's Brave New World. Bubble Puppy's live debut was as the opening act for The Who in San Antonio in 1967. After a few line-up the final roster for Bubble Puppy settled at Rod Prince and Todd Potter on lead guitars, Roy Cox on bass guitar, and David "Fuzzy" Fore on drums. In the spring of 1967, Bubble Puppy moved to Austin, Texas and signed a recording contract with Houston-based International Artists. Bubble Puppy scored a US Top 20 hit in 1969 with their single, "Hot Smoke & Sassafras". The name was a misheard line lifted from an episode of "The Beverly Hillbillies". The single peaked at number 14 on the Billboard 100 and number 15 (RPM) in Canada. In addition, the song was at the top of many radio station playlists over the spring of 1969. However, despite Bubble Puppy's early success with the "Hot Smoke & Sassafras" single, they experienced numerous conflicts with International Artists, and parted ways with the label in 1970. Signing Nick St. Nicholas of Steppenwolf as a manager, Bubble Puppy moved to Los Angeles in 1970. Their name was changed to Demian to avoid contractual difficulties with their previous record company. The group signed to ABC-Dunhill Records and released one self-titled album in 1971. CURRENT: On March 19, 2011, three of the original members of Bubble Puppy reunited for the first time in 25 years for a performance at The Austin Music Awards. The band also added Mark Miller (guitar) and Jimmy Umstattd (bass) to the line-up. David Fore met the two while playing in Austin cover band, the Kopy Kats. David and Mark also played together in the mid-70's in another popular Austin cover band, Zeus. In April of 2013, Gregg Stegall joined the line-up taking Todd Potter's place in the band. Gregg has a long-standing musical affiliation with Mark and Jimmy dating back from the early 1970s. “Bubble Puppy is back with a vengeance.” (Margaret Mosier, Austin Chronicle) Voted 3rd place for best performing Rock Band in Austin 2015, they have been performing since the Awards night in 2011. 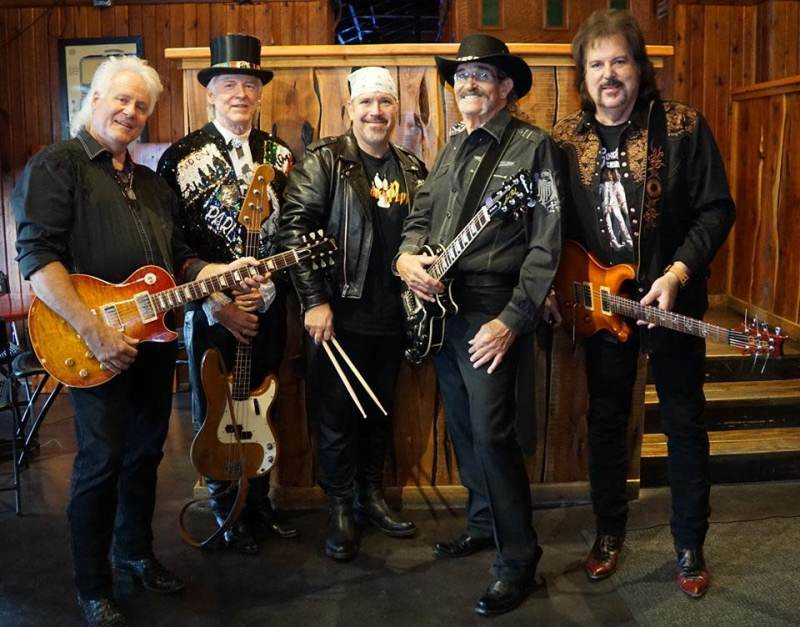 They also won a Texas Legacy Music Award and have been performing monthly from Austin to Houston, Corpus Christi to Padre Island, and San Antonio. On August 26, they will be on stage at the Moody Theatre for the All ATX show benefiting HAAM, recorded for PBS and joining Todd Rundgren along with other Austin All-stars. Jeff is a 4th generation Austinite from a family of musical talent. He began playing in his first band in 7th grade. By high school he was playing private parties & fraternity parties at The University of Texas. In the early 70's, while in college, he joined Phoenix with Tom Holden, Rodney Garrison & Leonard Arnold. From there he and Tom evolved into "Stump" with David Frame on bass and Stevie Ray Vaughan on guitar. When Stevie Ray left, he was replaced by Brian Wooten and the foundation for Too Smooth, Austin's premier all original rock band of the 70’s had emerged. After moderate local success, David Frame decided to depart the music biz and Brian Wooten introduced the band to Danny Swinney, bassist, who was the last piece of the puzzle for the original Too Smooth line-up.The band headlined shows at Austin's Armadillo Headquarters and opened concerts across Texas for acts such as Lynyrd Skynyrd, Aerosmith, Foreigner, Ted Nugent, Pat Benatar, Rush, Mountain, Leon Russell, Judas Priest and others. The band recorded 2 LP’s during the 70’s. Too Smooth played through the rest of the 70's in different renditions with Jeff Clark being the only original member throughout the entire duration. In 1981, Austin favorite 14K was formed, reuniting Jeff with Brian Wooten, drummer Chris Skiles of Too Smooth and Bobby Clouse on bass and vocals from Dallas. They played commercial hits and continued to play originals and open shows for acts including Cheap Trick, Three Dog Night, The Producers, & Eric Burdon. This foursome also recorded a number of originals yet to be released. This particular lineup was heralded as the best cover band in Texas at this time. Jeff now performs with Too Smooth whenever they have reunion concerts. In Sept 2015 played a concert in Austin at Threadgill's as "Jeff Clark & Friends", which featured Christopher Cross, Eric Johnson, Van Wilks, Tommy Taylor, Mark Miller, Greg Stegall, Mikel Arclight, Danny Swinney, Cole Newbury, Darin Murphy & Tommy Holden.